Annette Obrestad was born on September 18, 1988 in Sandnes, Norway. She is known by her nickmame "Annette_15" and her hometown is Sandnes, Norway. She holds a World Series of Poker Europe (WSOPE) bracelet which she won in 2007. 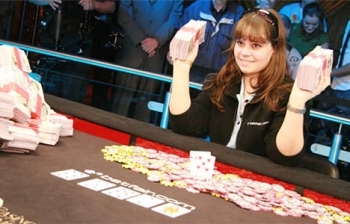 By winning this bracelet in 2007, she set a new record for being the youngest player to win a WSOPE bracelet as she did it at the age of 19 years old. She is also known for her online play and is one of the best online players in the world today, especially when it comes to the tournaments. She started playing poker when she was 15 years old and used the screen-name "Annette_15". The interesting part is, that Obrestad didn't have to deposit money at the poker sites in order to win money herself. According to her, she entered freeroll tournaments and after winning one after another she managed to get some cash into her online account. With the money she earned from those freerolls, she started playing in bigger tournaments, entering them with money in her account and after several tournament winnings, she earned several hundred thousand of dollars. Just so you could understand this girl's talent, between 2006-2007 she won more than $500,000 on PokerStars, $200,000 on Ultimate Bet, and $136,000 on Full Tilt Poker. But that's not all, as in 2007 she played online against 179 other players in a $4 buy-in tournament which she eventually won. What's the catch, you may ask? Obrestad won the tournament without looking at her cards at all except for one time when the decision was to go all-in or not. According to her, it was a demonstration on how important it is to play position in poker and that it is possible to win even without knowing your own cards, but playing according to your table position. In 2008, she won another $20,000 online after winning the Stars Sunday Hundred Grand which featured 20,000 players for a buy-in of $11. Three months later, she won another $35,000 online for winning the Betfair Sunday $125,000 GTD tournament. She also almost won the 2007 PokerStars EPT that was held in Dublin, but came in second to win $431,184. As of 2008, she has won over $2,500,000 in live tournaments only. She is one of the members in Team Betfair alongside with Sorel Mizzi and John Tabatabai. Obrestad can bring all her poker knowledge and talent to the WSOP Main Event that is held in the States only in the year 2010, when she'll be 21 years old, since according to Nevada's gaming laws, players must be at least 21 years old. On a different note, we would also like to offer you some of the best and most popular Christmas toys for this coming holiday for amazing prices so you'll be able to smile as well. Click the link to find out what's hot and choose your kid's next gift this year.